Following weeks of flip flopping back and forth between Albania and Spain, y’all finally have a new number one! 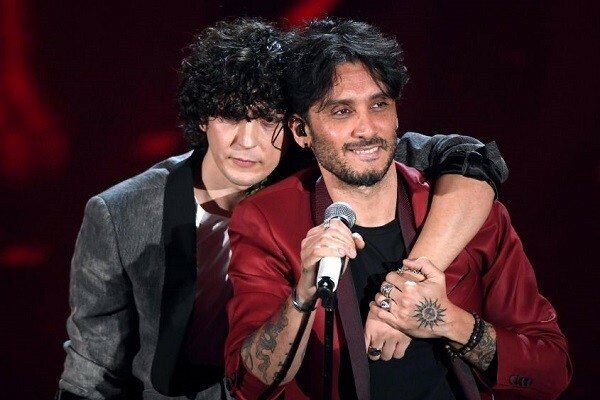 After counting a massive 11,277, we can now confirm that Italy’s Ermal Meta & Fabrizio Moro are your favourite Eurovision 2018 act so far. The “Non mi avete fatto niente” pair secured 2,922 votes, which equates to just over a quarter of all votes cast (25.91%). Spain’s Alfred & Amaia are knocked back down to second place. The couple managed to attract exactly 2,000 votes (17.74%) for “Tu canción”. They might have missed out on the top spot this time, but it’s their second highest vote tally so far. Albania’s Eugent Bushpepa and Denmark’s Rasmussen round out the top five. Switzerland’s Zibbz and Malta’s Christabelle continue to bring up the rear. Of course, there are plenty more songs to be chosen — we’re not even a quarter of the way there yet! The poll will relaunch on Sunday along with the winners of the selections in Belarus and Montenegro. What do you think of the current standings? Are you happy to have a number one that’s not Spain or Albania? And can Italy hold on to the top spot now that the competition is picking up pace? Who’s your Eurovision favourite? Let us know below. Italy and France is the worst so far. After giving the Italian song the attention it deserves, all I have to say is that in my opinion, this is exactly how a Eurovision winner SHOULD sound like. Go Italy. They’ve outdone themselves and brought an even better song that last year’s great one. Still think mall is the-best entry selected so far. Albania is in my top 10 this year for sure, people will appreciate it in May and why not even top5 just like Moldova did last year. Italy might win the entire contest, don’t even doubt it for a second. This time their message is super important and relevant, unlike the previous year which was essentially an ironic diatribe about modern culture. Anticomformism can get you some votes, but not the win. A humanitarian message on the other hand can get you a win, just ask Jamala. Spain bad, spain bottom , spain place 26th… blablabla… haters gonna hate (and annoy the rest of us). Just let it be, and enjoy your favorite entries. Not everything goes around Spain and spanish eurofans. Get over it people!!! Italy first, good choice. I like this, but I don’t think that the big audience will feel the same way. It’s kind of a “difficult” song if you are not italian. Italy its always in topp, WHY, i dont now. The best Song from Italy was 2013. And France. OMG, its so bad. Spann have a great Song this year. IT can be top 5, IF not the Guy gonna sing. Personally, I’d put France 1st and Italy 2nd. But truly Italy’s song is so good! I don’t know if they’ll stay on top in the next tops but love them both! Great song! What a joke! If that song were represented by a small country, only few people would say the entry is good. Boring at best! I don’t care about the meaning! The song is just ordinary. You’re from Italy? Cool! I’m from Mars. I agree with the results of the poll. Italy is the only good song so far to me. Spain and France are not that bad though and I can accept them at 2nd and 3rd, not much of a competition though. Hopefully better songs to come.. If Polegend Godgarina was less hypocritical with their opinions and had a more objective attitude towards each entry I could take them more seriously. Countless of times they have contradicted themselves by preaching Salvadore’s speech one minute then hating on a masterpiece the next. Oh and by the way Polegend is Italian so they know the lyrics – and apparently more about good music than the rest of Italy! Dammit, I didn’t reply under the right comment! Maybe the Italian votes are real, from non-Italian fans, but it’s 2017 all over again. Overestimated in the bubble, the intellectual song that impress the euro nerds, you can’t say anything bad about it because you’ll be told you didn’t understood the lyrics, the self important fans will call people stupid or racists for the next 3 months, and after May 12, these fans will have egg on their faces. Ask Gabbani. Rigged AF. Wiwibloggs stop doing these polls. :O Am I Italian? sometimes I wish Italian food is amazing! I have a feeling that Italy will do poorly this year, like around 20th place. Yes, Ermal is Albanian so that’ll guarantee good points from Albania, but ethnically so is Eleni Foureira, who I think is more well known. More than deserved! Thank you Italy for this wonderful song! Italy will be last, nobody understands the language, no screen in Lisbon to have a background, 2 guys dancing on stage, their weird moves are no clue that the song is about terrorism, no charisma. Of course Italians will say that this is their Sanremo winner, and was not chosen with ESC in mind, fine, but don’t complain when you will be last in May. lol italia!! it’s certainy not my favourite but the favourite of italians obsessed fans without objectivity……….and as here there are only poor victims of bookmakers opinions without having their own opinion and taste,, then check the bookmakers now and you will see italia at the 16th place, don’t cry lol………………………..and no comments about the second place for spain and their poor entry but I can tell the same for them as for italians. What are you mumbling about? This song is brilliant! And I’m not even italian and I have no idea and don’t care about bookers odds. Just respect others’ taste! Except for Spain, I totally agree with this top 9. Except for Italia and Spain I totally agree with this top 9. I find it hard to feel sorry for them! How people love to complain. Yes you are. I was last in the first hour, with about 15 votes. It gained 600 votes in the next couple of days. When did you last check the poll? It was last after two days or something, I’m pretty sure about that. I don’t even want to argue with anyone, I said what I wanted, I’m not mad. I just find it annoying. You’re wrong! The very first day this poll was published they were 7th and then they gradually moved to 4th. Last time I checked, about 2 days ago, they were 4th or 5th, so they didn’t magically gain votes the last hours. I must say that you are lying. Albania was never last in this poll, i checked everyday. It even was third at a point. And also Eugent hasn’t shared the post anywhere. He isn’t active in any social media except for facebook and he hasn’t shared anything there. And you are complaining about the 4th place. Seriously?! I LOVE Albania, it is in my top 3. Does my opinon NOT count on this?